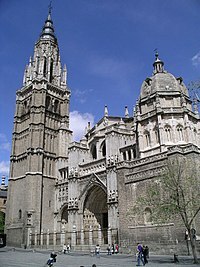 This is a list of Roman Catholic cathedrals in Spain. The cathedral of Burgos, showing Gothic architecture in Spain. León's Cathedral is constructed in a high-gothic style and is noted for its stained-glass windows. Santa Maria de Manresa is the Romanesque-Gothic Cathedral of the town of Manresa. This page was last changed on 5 February 2016, at 10:22.